You can purchase land plots and drill oil wells in this section. Obtaining crude from land plots involves 4 steps: surveying land, purchasing land, drilling wells, and selling land. Surveying land allows you to make an informed decision of which land plot to buy. You must purchase land before you can drill wells on it. Drilling wells will actually extract the oil and put it in your inventory. A depleted plot is automatically sold, but you can choose to sell it earlier if you wish. Total Owned Plots: The total number of plots you currently own. Plots for Sale: The number of plots you can purchase in the county. Avg. Plot Price: The average price for each plot of land in the county. 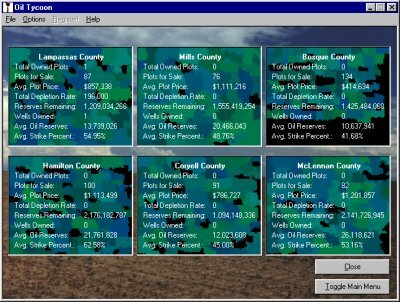 Total Depletion Rate: The amount of crude you are receiving from the county each turn. Reserves Remaining: The amount of crude oil still available from the plots in the county. Wells Owned: The number of wells on land plots you own. Avg. Oil Reserves: The average amount of crude in each plot in the county. Avg. Strike Percent. : The average strike percentage. The strike percentage is the likelihood of finding oil when you drill a well. Close button: Closes the current screen and returns you to the main menu. Toggle Main Menu button: Opens the main menu without closing the current screen. If the main menu is already shown, clicking this button will hide the main menu. To proceed into a county, click on the box for the county you wish to see. You can work with your land plots and oil wells on this screen. The county is shown in the large box just under the name. Below that, a list of statistics for the currently selected plot can be found. The right area is where you can survey, purchase, and sell plots and drill wells. Cash: This is the amount of cash you currently have available to you for purchases. Land Value: The value of the currently selected plot. This is the amount of cash required to purchase the plot if you do not currently own it. Otherwise, it specifies the amount you can sell the land for. Wells: (only displayed if the current plot has wells) The number of wells currently on the plot. Pumping Rate: (only displayed if the plot is surveyed) The amount of oil received from each well each turn. Cost per Well: (only displayed if the plot is surveyed) The cost of each well. Usually, the lower the pumping rate, the lower the cost per well. Strike Percentage: (only displayed if the plot is surveyed) The likelihood that drilling a well will strike an oil reserve. On average the number of wells that will successfully drill oil is the number of wells you drilled times the strike percentage. Oil Reserves: (only displayed if the plot is survyed): The total amount of oil remaining in the plot and available for drilling. Depletion Rate: (only displayed if the plot has wells) The number of gallons depleted from the plot each turn. Depletion Month: (only displayed if the plot has wells) The month at which the current plot will be completely depleted of oil. Plot Area: The total size of the plot. Survey Plot: Surveying a plot allows you to find more information out about it before purchasing it. You can find out the amount of oil underneath it, the pumping rate, and the strike percentage. You can also compare the plot to other surveyed plots on the various maps. Surveying takes 1 turn and is required before you can purchase a plot. To survey a plot, click on the plot and click Survey Plot, then click OK. To survey multiple plots, click Survey Plot, then click Multiple Plots, then click the plots you want to survey. When you are finished, click OK. To survey all plots, click Survey Plot, then click All Unsurveyed Plots. All the unsurveyed plots will be selected, and click OK to survey them. Purchase Plot: Once you own a plot, you can begin the process of extracting oil from it. Purchasing takes 1 turn and is required before you can drill any wells. To purchase a plot, click the plot you want to buy (it must already be surveyed), click Purchase Plot, and click OK. To purchase multiple plots, click Purchase Plot, click Multiple Plots, and click the plots you want to buy. When you are finished, click OK. To purchase all plots, click Purchase Plot, then click All Surveyed Plots. All the surveyed plots will be selected, and click OK to buy them. Drill Wells: Drilling wells will extract the oil from a plot you own and place the crude in your inventory. The amount of crude you receive per turn is the number of wells times the pumping rate for the plot. Most of the time, you won't get all the wells you drill because all of them won't find oil. On average, the number of wells that find oil is the number you drilled times the strike percentage. Drilling wells takes 1 turn. 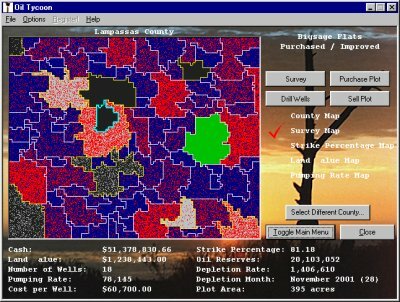 To drill wells, click the plot you own that you want to drill on, click Drill Wells, type in the number of wells, and click OK. To drill wells on multiple plots, click Drill Wells, click Multiple Plots, select the plots you want to drill on, type in the number of wells (per plot), and click OK.
Sell Plot: The game automatically sells your plot after it is depleted of oil. You can, however, choose to sell a plot you own before then. The amount of cash you receive from the sale is a small percentage of the original worth of the plot. Selling a plot takes 3 turns; the first turn is spent finding a buyer, while the sale is being negotiated in the second turn. The plot is sold on the third turn, and you receive the cash from the sale at that time. To sell a plot, click on the plot you want to sell, click Sell Plot, and click OK. To sell multiple plots, click on Sell Plot, click on Multiple Plots, choose the plots you want to sell, and click OK. To sell all owned plots, click on Sell Plot, click on All Owned Plots, and click OK.
White border: Normal border around a plot. Yellow border: A plot you own. Thick blue-green border: The currently selected plot. Thick light-blue border: The plot is being surveyed. Thick pink border: The plot is being purchased. Thick light-green border: The plot is being sold. Thick light-yellow border: Wells are being drilled on the plot. Purple border: The plot is selected for an operation, such as purchase multiple plots, etc. There is no color-coding on the County Map. 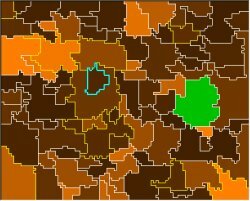 Each plot has its own representative color. Dark blue-green: An unsurveyed plot. Blue with red spots: A surveyed plot. The more red spots in the plot, the higher the concentration of oil reserves. 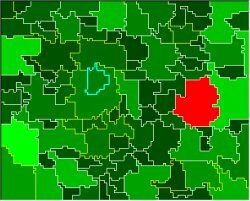 Gray with red spots: A purchased plot with no wells. The more red spots in the plot, the higher the concentration of oil reserves. Black with gray spots: A purchased plot with wells. The more gray spots, the lower the amount of remaining crude oil in the plot. Green: A sold plot, or one in the process of being sold. 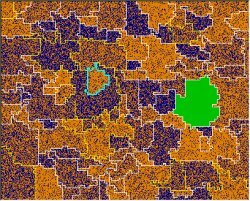 Blue with yellow spots: A surveyed plot. The more yellow spots in the plot, the higher the strike percentage. Green: The lighter the shade of green, the more valuable the plot is. Red: A sold plot, or one in the process of being sold. Select Different County: Returns you to the Select County screen. Close: Closes the current screen and returns you to the main menu. Toggle Main Menu: Opens the main menu without closing the current screen. If the main menu is already shown, clicking this button will hide the main menu.